The Telegraph (UK) has put the word “genocide” in its headline as a description of what has been going on in Syria. On Wednesday morning, more persons were killed in Homs, as the Syrian military invaded strongly Sunni neighborhoods and drove toward the city center. Tanks and artillery barrages have been used against civilian crowds. The BBC suggests that some 32 adults were killed Wednesday morning, along with 18 premature babies in hospital who died with the electricity was cut. The Gulf Cooperation Council group of Arab oil monarchies expelled their Syrian ambassadors and called their own envoys home on Tuesday, out of disgust at the ongoing massacre. The use of tanks and artillery against non-combatant, civilian populations in rebel districts is a war crime. Systematic deployment of war crimes in turn become crimes against humanity. If the regime has in fact been targeting Sunni neighborhoods in Homs that had engaged in peaceful demonstrations, that would be a crime against humanity right there. 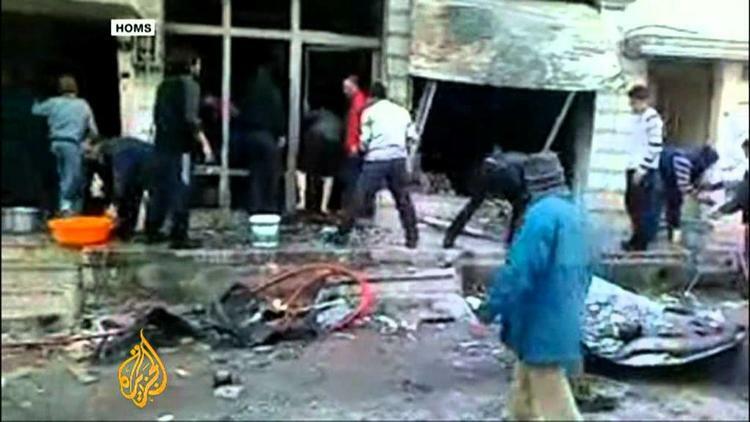 The evidence is that Homs residential neighborhoods are being intensively bombarded. Because of the Russian and Chinese veto at the UN Security Council, there is no authorization for the use of force by international actors. In the absence of such authorization, the US has been reduced to trying to target individual regime figures for financial sanctions and for prosecution if they ever leave Syria.